In a recent paper in Nature magazine, a group of researchers including MBARI’s Yui Takeshita show that when a coral reef was exposed to artificially acidified seawater, the corals and coralline algae retained less calcium carbonate, which they need to build their skeletons, and thus the reef grew more slowly. This could cause some reefs to shrink or even disappear as seawater continues to increase in acidity over the next 100 years. This study was the first to demonstrate such an effect on an entire reef ecosystem rather than on individual corals or corals of just a few species. Over the past century, as humans have released more and more carbon dioxide into the atmosphere, seawater has become more acidic, a process known as ocean acidification. Corals are particularly sensitive to ocean acidification because they must extract calcium carbonate (CaCO3) out of seawater in order to build their skeletons. As the acidity of seawater increases, this process becomes more difficult. Scientists have known this in principle for decades, and many laboratory experiments have shown that it is a serious concern. However, researchers have had a hard time designing experiments that could quantify the effects of ocean acidification on entire coral-reef ecosystems, which include multiple species of corals and coralline algae (which also need calcium carbonate to grow). To address this issue, Takeshita and his fellow researchers, led by Rebecca Albright of the California Academy of Sciences and Ken Caldeira of the Carnegie Institution for Science, conducted an experiment on One Tree Island—a small island in Australia’s Great Barrier Reef. This island consists of two small lagoons separated by a shallow reef flat. Each day, as the tide drops, seawater flows over the reef flat as it drains from one lagoon to the other. During their experiments, the researchers made the water in the upper lagoon more acidic by adding carbon dioxide. 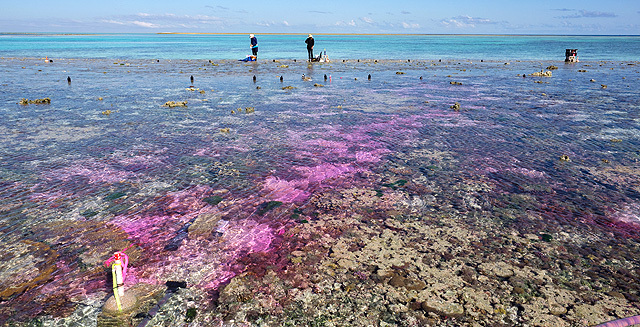 They also added colored dye, which allowed them to track the flow of the acidified seawater over the reef flat. This novel approach allowed the researchers to measure, for the first time, the biological response of a natural marine community without using artificial structures, such as chambers or flumes. 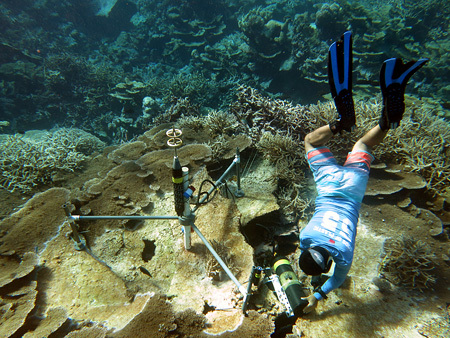 MBARI Scientist Yui Takeshita dives on a coral reef during an earlier experiment at Palmyra Atoll. Photo by Jennifer Smith. To understand how fast the reef was growing, the researchers measured “net community calcification” (NCC)—the amount of calcium carbonate taken up by reef organisms as they build their skeletons. High levels of NCC indicate that the reef-building organisms are taking up lots of calcium carbonate, which means the reef is growing rapidly. Low levels of NCC indicate that the organisms are taking up less calcium carbonate and are growing more slowly. The results were clear. Net community calcification was about one-third lower when the reef was exposed to a level of acidified seawater that could occur in the next century. This could be bad news for coral reefs, which need to grow continuously to keep up with a constant attack from waves, sea-level rise, and animals that burrow into and erode the reef structure. If reefs aren’t growing fast enough, they may gradually shrink and can even disappear beneath the waves.